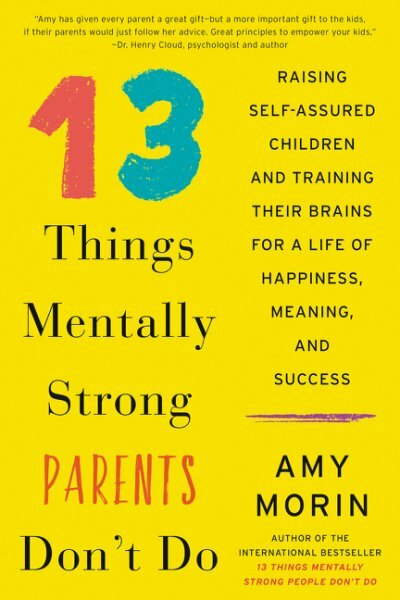 When I reviewed Amy Morin's book, 13 Things Mentally Strong People Don't Do, a few years ago, one of the things I most wanted to ask was a way to teach my children the skills and habits she talked about. I was excited to see the parenting version of 13 Things pop up this month. Although it is more for the parents than the children, it gives caregivers a framework for helping children build the grit, resolve, and mental strength they'll need as they learn and grow. I am the mother of six amazing and energetic kids. Most of the time they are a joy to be around, but occasionally their energy leads me to call them my terrifying space monkeys. Naturally, because I was reading a parenting book, the Universe (or Coincidence if you prefer) decided that my kids should help me put Ms. Morin's suggestions to the test for a couple of weeks by pushing boundaries more aggressively than usual. Here is what we found. In our family, the most important "don'ts" to work on are giving kids too much power (chapter 5), letting kids avoid responsibility (chapter 7), and taking shortcuts (chapter 12) which is pretty much the fuel for the first two. I am a short-cutter. There, I said it. With six space monkeys and a husband who travels frequently, I am often completely spent at the end of the day and just don't have the energy to avoid the other pitfalls. Morin's suggestions, however, have helped quite a bit. In each of the chapters of 13 Things Mentally Strong Parents Don't Do, Morin explains the problem habit clearly. She gives great annecdotes to illustrate her points, all while making sure that her suggestions are grounded in the latest science. The short TL;DR highlights sections at the end of each chapter are helpful refreshers and a great starting point to identify specific parenting behaviors both to incorporate and to avoid. The book is clear, logical, and more-or-less chapter independent. I think if a reader were to simply scan the Table of Contents, it would be easy to dive into just the issues that applied to that reader's parenting habits. I've read literally dozens of parenting books over the last fifteen years, and this is one of the best I've read for empowering parents to do better at the most important job they will ever have.